Employees in a busy office may need to print out a lengthy report one minute, then fax and make copies the next. Get it all done from one machine with this HP Officejet 7612 wide format wireless color inkjet all-in-one machine, which prints, scans, copies and faxes. Built-in Wireless-N connection offers cable-free convenience. Wired networking is also supported via Ethernet and USB ports. 2.64" display with a TouchSmart frame lets you easily navigate features. Prints up to 15 ISO pages per minute in black and white, 8 ISO pages per minute in color. (Manufacturer speed ratings). Prints up to 600 x 1200 dpi resolution in black and white, up to 4800 x 1200 optimized dpi in color. Ultra-high resolutions help ensure crisp, clear, vivid results. 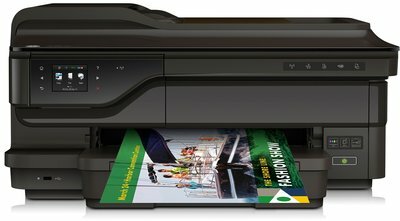 HP Officejet 7612 wide-format borderless printing up to 13" x 19" for framing and displaying. Copies up to 9 ISO copies per minute in black, up to 6 ISO copies per minute in color. Copy resolution up to 600 x 1200 dpi in black and white and up to 4800 x 1200 optimized dpi in color. Scan large documents with the 11" x 17" flatbed scanner. Scan resolution up to 1200 x 1200 dpi to reproduce exact colors and large documents. High-speed fax with 100-page memory supports speeds as fast as 4 seconds per page. Compatible with a variety of media types. Prints on plain paper, photo paper, greeting cards, brochure and flyer paper, card stock and more. Auto document feeder saves time and effort. Lets you process up to 35 sheets unattended. Great for copying, scanning or faxing multipage documents. 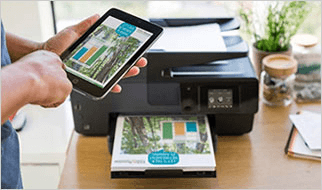 HP Officejet 7612 features mobile printing from your smartphone or tablet with HP ePrint and AirPrint™. A3+ - 13" x 19"
PC:Windows 8, Windows 7: 1 GHz 32-bit (x86) or 64-bit (x64) processor, 2 GB free hard disk space, Microsoft Internet Explorer, CD-ROM/DVD or Internet, USB; Windows Vista: 800 MHz 32-bit (x86) or 64-bit (x64) processor, 2 GB free hard disk space, Microsoft Internet Explorer, CD-ROM/DVD or Internet, USB. ; Windows XP SP3 (32-bit only): Intel® Pentium® II, Celeron® or 233 MHz compatible processor, 750 MB HD, Microsoft Internet Explorer 6, CD-ROM/DVD or Internet, USB. Produce professional-quality color prints from 3 x 5 to 13 x 19 inches, and copy, scan, and fax with ease. Market your business with borderless flyers and brochures that dry fast2 and last for decades.3 Print affordably with individual inks. Simplify printing tasks and handle high-volume jobs with ease—backed by HP dependability. Scan large documents—up to 11 x 17 inches—in a single pass, using a surprisingly compact HP e-all-in-one with intuitive controls and 250-sheet paper tray. 1 Wireless performance is dependent upon physical environment and distance from access point. Wireless operations are compatible with 2.4 GHz routers only. 2 Water resistance based on HP internal testing, using paper with the ColorLok® logo. 3 Fade resistance based on paper industry predictions for acid-free papers and Original HP inks; colorant stability data at room temperature based on similar systems tested per ISO 11798 and ISO 18909. 4 Requires an Internet connection to HP web-enabled printer and HP ePrint account registration. For a list of eligible printers, supported documents and image types, and other HP ePrint details, see www.hpconnected.com. Mobile devices require Internet connection and email capability. May require wireless access point. Separately purchased data plans or usage fees may apply. Print times and connection speeds may vary. 5 Program availability varies. Original HP cartridge return and recycling is currently available in 47 countries, territories, and regions in Asia, Europe, and North and South America through the HP Planet Partners program. For more information, visit hp.com/recycle.